Busy professionals and students who are constantly on the go often have many things to think about. There are the endless meetings whether done virtually or in person, staying connected to your business or teammates, and making sure you always have your essentials with you no matter where you are. This is even more crucial if you find yourself incessantly going somewhere. Meetings, school, lunch, the gym, or anything else life throws at you. You have to be prepared. That’s why having a good all-around backpack can provide you with the ease of mind you need to focus on your daily grind. The High Sierra Loop Backpack does just that. Made specifically for active professionals and students, this backpack has got you covered. The High Sierra Loop Backpack is ideal for everyday use. This entire bag is spacious but provides you with several compartments to easily stash your devices and daily essentials. Not too many and not too little, either: its compartments include a dedicated TechSpot sleeve for your tablet, mesh side pockets for beverages, an organizer pocket for your keys and smaller necessities, and exterior pockets so that you can easily reach for your valuables when needed. 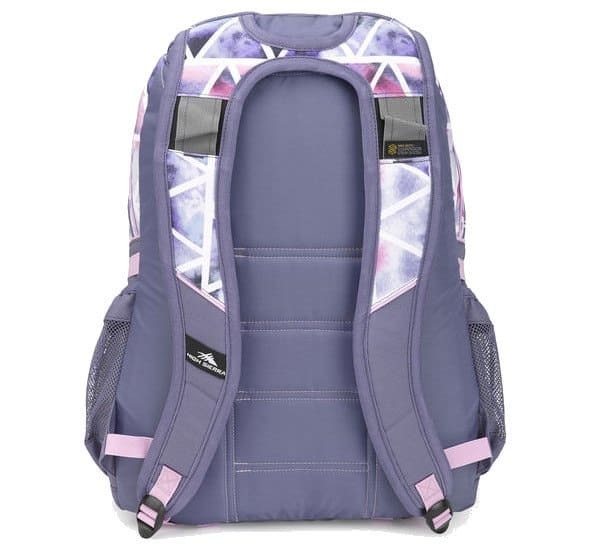 Students and professionals will also appreciate the fact that the High Sierra Loop Backpack can double as a super efficient, stylish hiking backpack. Versatility doesn’t get any better than this. With a 33-liter capacity, it makes the ideal day hike backpack, saving you money because of its versatility. The bottom compression straps on the bag can also be used for effortless attaching of extra gear. 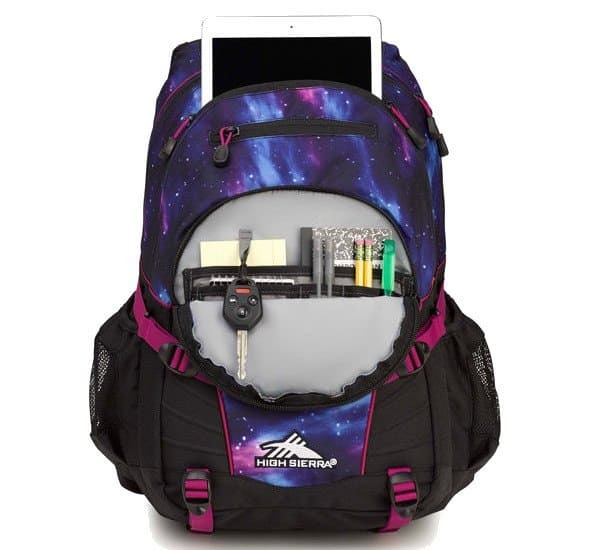 The High Sierra Loop Backpack is huge on functionality while making life more convenient and enjoyable for you no matter how busy your lifestyle is. However, all of that wouldn’t matter if you fill up the bag to its 33-liter capacity, and it’s uncomfortable to wear, right? Well, the good news is that the High Sierra Loop Backpack is designed with a yoke-style S-shaped mesh padded shoulder straps, equipped with a suspension system primary padded back panel. Gone are the times you end your days with a sore, painful back because of your choice of bag. In short, it’s ultra comfortable to wear and won’t cause a strain on your shoulders or back. 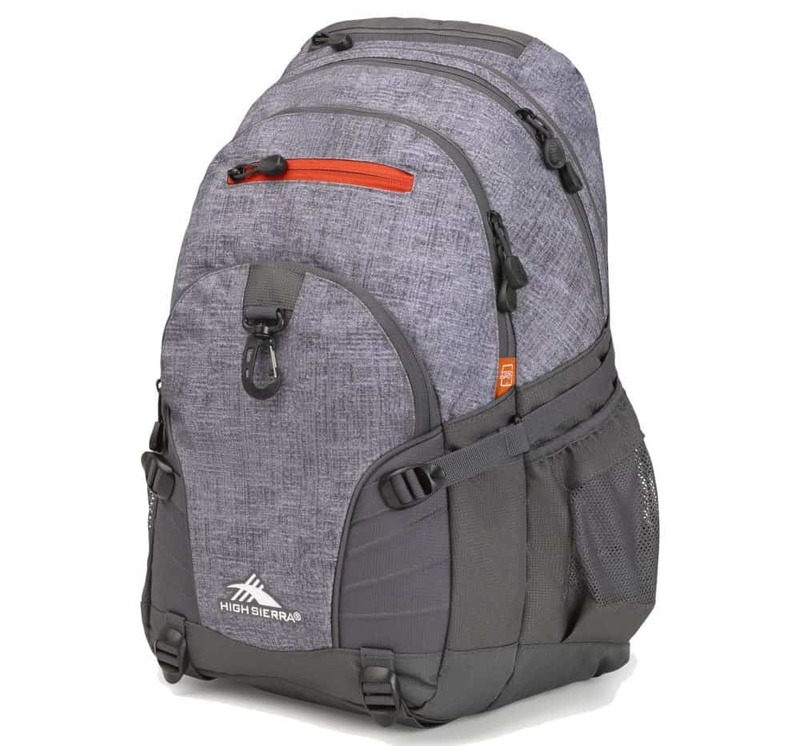 Adventure enthusiasts in the know trust High Sierra for their line of durable, feature-rich backpacks that can take you from the office to a hike. Since 1978 they have been manufacturing adventure gear with the intention of giving adventurers exactly what they need to complement their lifestyle. If High Sierra’s bags are made for rugged outdoor use and travel, then you know it’s going to be strong enough to withstand wear and tear from your daily grind. The High Sierra Loop Backpack is made with a 500 x 500-Denier waffle weave ripstop Duralite fabric for superior water resistance. This feature makes it handy for individuals who frequently commute or hike in unpredictable weather because your gear should always be dry – including your valuable devices! Aside from its functional compartments, it also comes with smaller pockets and other features to keep your tinier items well organized. These include pen pockets, a key fob hook, and a front attachment clip. With its non-slip, adjustable shoulder pad, this backpack does the work of distributing weight evenly on your shoulders. It can easily be adjusted to accommodate your height, but if it isn’t in use, then you can remove it. The mesh padded shoulder straps and suspension system add to even greater comfort when in use. When you’re on the go, it’s important that you also stay hydrated. The High Sierra Loop Backpack makes that easy thanks to its side mesh beverage pockets. Just stash your water bottles in, and reach for it without any issues whenever you need. The High Sierra Loop Backpack is essential gear for busy people who also love the outdoors. You can’t go wrong with its many useful features, but it’s also a beautiful and stylish bag that comes in different color combinations to suit your style. Dimensions: 19.0 x 13.5 x 8.5 inches, weighs 2.04 lbs. Those are pretty solid features for an all-around backpack, and best of all the High Sierra Loop Backpack is affordable. We had a look at customer reviews online to see what the feedback was from customers who have bought and used the High Sierra Loop Backpack. It’s clear they all love it! Customers have pointed out how pleased they were the High Sierra Loop Backpack held up so well, even for frequent travelers. We all know the harsh wear and tear that our bags have to hold up to when we’re on the road, and it seems that this model makes a terrific travel backpack. People have written about the length of time they’ve been using it, and it’s great to know that the High Sierra Loop Backpack lasts years. Customers appreciate how this bag makes it easy to keep your things organized. It doesn’t break the bank, either. However, some customers said that they preferred for this bag to have some padding at the bottom. Though its TechSpot sleeve is made for tablets, many customers were able to use it for laptops although it isn’t as safe without the padding so one needs to be extra careful putting it down on hard surfaces. A few reviews also mentioned poor quality sewing. All in all, the High Sierra Loop Backpack is the perfect everyday bag for people on a budget. It’s made to withstand rough use so you never need to worry about durability or it breaking down on the road. The High Sierra Loop Backpack can be yours with a few clicks online. Just head over to your favorite online shop, or check out Amazon because they are known for great deals on travel bags such as this. Far too many people underestimate the importance of carefully choosing a backpack, especially if you live a busy lifestyle and are always on the road. The High Sierra Loop Backpack was made specifically for accommodating your needs while ensuring you are comfortable. Value for money and functionality can all be found in this terrific, great-looking backpack.